Hand painted with various school graphics and has a coordinating apple green grosgrain ribbon tie. Machine wash in cold water. Size 6; waist 22", length is 11". This is a recycled product; the original skirt is a " Gymboree" brand and has panda face and blue flowers on the original skirt. Look for an ice-dyed top to compete your outfit. Welcome to Audie Mae Designs. I am so pleased to be able to share my painting passions with you. 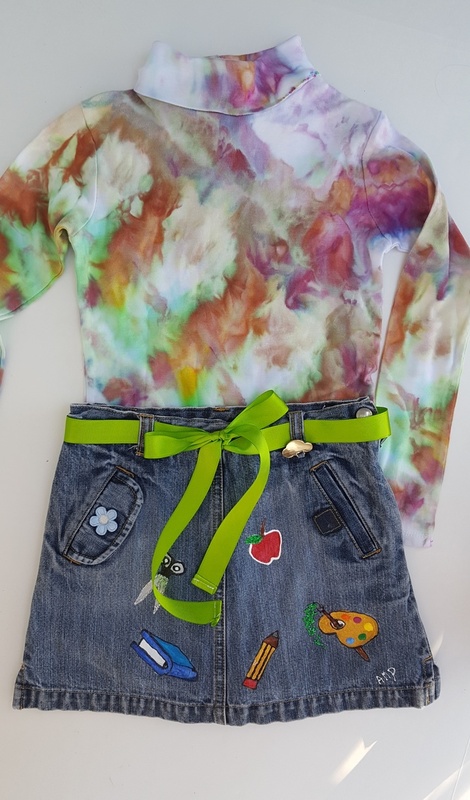 I love painting on fabrics and making items out of recycled denim like aprons and upcycled children's clothes. I also make and paint pillow covers; with shorebirds being my favorite topic. You can also find more of my items on www.etsy.com/shop/AudieMaeDesigns.